Green Debris Netting. Will assist in reducing the risk of accidents to the work force and gene..
Green Debris Netting 3m x 50m. 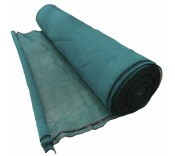 This green debris netting will assist in reducing the risk of ac..
Blue Debris Netting 2m x 50m. This debris netting will assist in reducing the risk of accident..
Blue Debris Netting 3m x 50m. This debris netting will assist in reducing the risk of accidents..